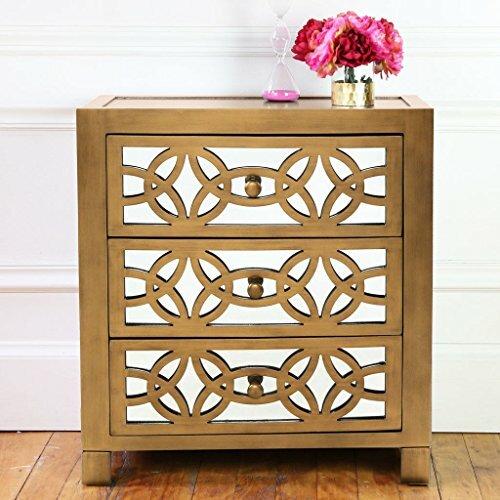 Add statement-making style to your favorite aesthetic with this three-drawer chest, defined by its mirrored panels and geometric fretwork. Its metallic finish adds a sophisticated touch to any space while its understated silhouette blends effortlessly into any formal arrangement. Lean into this piece's glam inspiration by adding it to a luxe master suite comprised of a crystal-inspired tufted headboard and a faux-leather bench for a cohesive look, then round out the room with a chic shag rug for a touch of texture. Perfect for stowing seasonal garb and spare blankets, this design can also be topped with an array of framed family photos for personal charm or a bowl of shimmering glass orbs for an artful accent. With its distinctive look and ample interior space, this sleek chest is a must-have addition to your favorite aesthetic. If you have any questions about this product by Willa Arlo Interiors, contact us by completing and submitting the form below. If you are looking for a specif part number, please include it with your message.